Cajuns love “dirt,” like dirty rice and this dirt cake. If you want to get all the dirt on your neighbors, serve this at your next garden party. Sit down and learn the dirty little secrets of making this cake. Crush Oreos and set aside (you can use a food processor for this step) or place in a Ziploc bag and smash with a spoon. Cream together the margarine, cream cheese, and sugar and set aside. Mix milk and pudding. Add to the creamed ingredients and mix well. Fold in the Cool Whip. Layer ingredients starting and ending with Oreos (it looks particularly cute if you layer this in a clean flowerpot). Refrigerate overnight before serving. 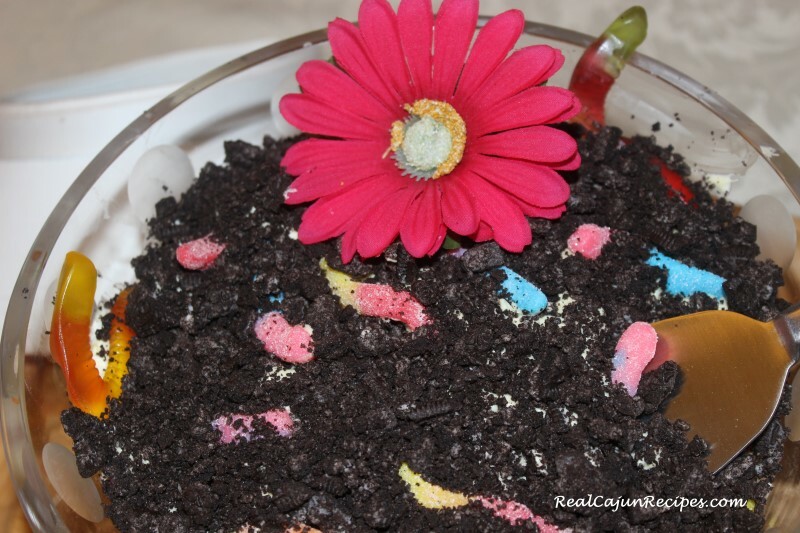 To make this dirt cake extra cute, you can put a few gummy worms on top, plant a silk flower in the middle of the cake, and/or serve the cake with a garden trowel.